Meet Emma Childs the newest massage therapist working out of the Fleet and Farnham clinics. She qualified as a massage therapist after completing her Diploma of Sport in 2009 whilst living on the Gold Coast, Australia. Emma is experience in many massage techniques including Remedial massage, Manual Lymphatic Drainage, Cross Fibre Friction, Myofascial release, PNF stretching, Trigger point therapy, Deep tissue, Pregnancy massage and Hot Stone therapy. She is also trained in Reiki healing. Emma says “ I have a passion for helping people, and feel very blessed to do what I love every day”. To find out more about Emma read her interview by clicking on the link below. With Spring equinox behind us and the potential for nicer, lighter weather looming, we're encouraged out of our winter hibernation and into a natural period of more energy and drive. Perhaps now is the time to think about self care or booking some activities to enjoy with friends. An extended yoga class with Charlotte Temple. Yin Yoga teacher training run by Seasonal Yoga - a monthly modular class that you can combine together to give you a certification. Restorative Yoga class with Babs Lehner-Platts. There are many other exciting guest workshops in the pipeline. In May and beyond we have our own Yin Yoga and Yoga Nidra class run by Yvette as well as Seasonal Teachers continuing their Yin teacher certificate. There are workshops on Yoga in the NHS and social prescribing as well Chair Yoga and Qigong. Anna Knowles is offering a 5 week course on Yoga Nidra throughout June and July and there will be many more guest yoga teachers hosting over the next few months. Keep an eye on our What's On boards in the clinics for more details. Running requires sustained, repetitive muscle contractions. The greater these contractions are, the greater the force generated and the more muscle fibres are required to shorten. These sustained, repetitive muscular contractions translate into speed, power and distance, allowing us to run further and faster. However, this can also translate to shortened, tight muscles, joint range of motion loss and decreased circulation to compressed tissues. Massage works to elongate the muscles, relieve muscle tightness, restore joint range of motion and improve circulation. In a nutshell, massage improves the effectiveness of the circulatory system. This system is responsible for oxygen transfer, nutrient delivery and waste removal at a cellular level. Our circulatory system delivers blood enriched with oxygen and nutrients, like glucose and electrolytes, to muscle tissue. It then picks up and removes muscle metabolic by products and waste. Furthermore, the circulatory system impacts all the other systems of the body too. Therefore, increasing the effectiveness of the circulatory system directly or indirectly impacts our entire body. Better circulation means better delivery of nutrients and oxygen to surrounding cells and tissues. Therapeutic massage can elicit very specific physiological responses, such as increased blood circulation, increased diameter of blood vessels and decreased blood pressure. These effects are significant for everyone but are of particular importance to a runner looking for ways to recover faster, prevent injuries and improve performance. Keep in mind though that “therapeutic” massage means a specific type of massage which involves applying a deep pressure that is designed to be corrective to soft tissue. This is very different to a spa or relaxing massage and it must be administered by a trained professional. Our massage therapists at Durham House are qualified and experienced in many different types of massage therapy. Like the chocolate bunny and the dyed eggs, it’s difficult to pinpoint exactly when people started this Easter tradition of making hot cross buns - sweet rolls studded with raisins or currants and marked with a cross on top - during the week leading up to Easter Sunday. It’s said the tradition started in the 12th century with a monk who was inspired to mark his rolls to celebrate Good Friday. Some say the tradition of baking bread marked with a cross is linked to paganism as well as Christianity. The pagan Saxons would bake cross buns at the beginning of spring in honour of the goddess Eostre - most likely being the origin of the name Easter. The cross represented the rebirth of the world after winter and the four quarters of the moon, as well as the four seasons and the wheel of life. According to some historians, it wasn’t until Tudor times that it was permanently linked to Christian celebrations. During the reign of Elizabeth I, the London Clerk of Markets issued a decree forbidding the sale of spiced buns except at burials, at Christmas or on Good Friday. For whatever reason or belief you choose to bake a batch of hot cross buns on Good Friday, it will most likely be to enjoy them with your loved ones. Whether it be for Eostre, Easter or the beginning of a much awaited spring - enjoy! In its simplest form, massage is the external manipulation of the skin, muscles, tendons, ligaments and bones with positive intentions of relaxation and psychological or physical benefit to the recipient. Massage is generally considered part of complementary and integrative medicine. It's increasingly being offered along with standard treatment for a wide range of medical conditions and situations. Studies of the benefits of massage demonstrate that it's an effective treatment for reducing stress, pain and muscle tension. To understand more about the history and evolution of massage therapy click on the article link below. Jon practices a personalised approach to health care which recognises the uniqueness of each patient. Whilst acupuncture is his primary method of treatment, Jon will create a plan that also incorporates lifestyle advice and nutrition, all of which is tailored to address the underlying cause of a problem. Jon graduated from the College of Integrated Chinese Medicine with a BSc (Hons) degree in Acupuncture and Chinese Medicine. During his clinical training, Jon was very fortunate to be mentored by some of the UK’s most experienced and respected acupuncturists. Since his late teens Jon has followed a deep interest in healing and has been on a path of continued learning. As a member of the British Acupuncture Council (BAcC) Jon follows a strict code of conduct and is professionally insured. A spring based yoga workshop hosted by Natalie Coleman and Yvette Meredith. A series of non smoking workshops run by our hypnotherapist Viv Evans. An exciting new Ashtanga Yoga class and a men's yoga class instructed by Brad van Bylevelt. A yoga detox workshop with doTERRA essential oils run by Eva of Essential Love. Workshops on various topics delivered by the Seasonal Yoga Teachers - this month's is yoga for insomnia. In April we have our own Yin Yoga and Yoga Nidra class as well as Seasonal Teachers launching their Yin teachers certificate. There are workshops on yoga in the NHS and social prescribing and many guest yoga teachers hosting over the next few months. Choosing an acupuncturist, or any healthcare provider, is an important part of your healing and wellness process. It’s all too often that we are quick to trust “the expert” more than we trust ourselves, especially when it comes to our health. A good acupuncturist is looking to empower you to take ownership of your own recovery. The relationship that you have with your practitioner is really important so we have written some tips to help you choose the right person for you! Whether it's an acupuncturist, a massage therapist, a chiropractor or any other practitioner, here are some things we think will help you feel confident in selecting the right practitioner and, specifically, a good acupuncturist! Lent – the 40 days leading up to Easter – was traditionally a time of fasting and on Shrove Tuesday, Ango-Saxon Christians went to confession and were “shriven” (absolved from their sins). A bell would be rung to call people to confession. This came to be called the “Pancake Bell” and is still rung today. Shrove Tuesday always falls 47 days before Easter Sunday, so the date varies from year to year. This year Shrove Tuesday is 5th March. The pancake has a very long history and has featured in cookery books as far back as 1439. The tradition of tossing or flipping them is almost as old: “And every man and maide doe take their turne, And tosse their Pancakes up for feare they burne” (Pasquil’s Palin, 1619). For some interesting alternatives, check out our versions in the recipe attached. This results in the body producing natural substances, such as pain relieving endorphins. It's likely that these naturally released substances are responsible for the beneficial effects experienced with acupuncture. A course of acupuncture usually creates longer lasting pain relief than a single treatment. Practitioners who adhere to traditional beliefs about acupuncture believe that when Qi doesn't flow freely through the body, it can cause illness. They also believe acupuncture can restore the flow of Qi and so restore health. The Acupuncture Evidence Project reviewed the effectiveness of acupuncture for 122 treatments over 14 clinical areas. They found some evidence of effectiveness for 117 conditions. Elliot is a registered chiropractor who graduated from the Anglo-European Chiropractic College in Bournemouth with a Masters of Chiropractic. He is also one of our flexicore instructors. Elliot treats a wide range of patients suffering from headaches to shoulder problems. He has a particular interest in sports and movement related issue, including analysis of walking and posture during activities and has attended post-graduate courses reflecting this interest and worked at events such as The Triathlon World Championships and the London Marathon. Read to see how he fared against our quick fire 15 questions in 60 seconds! Hopefully your 2019 started well and you managed to spend some time looking after yourself. A mindfulness workshop with Babs Lehner-Platt at Inner Focus counselling. A restorative yoga and meditation class also hosted by Babs. Our very own Yin Yoga and Yoga Nidra class hosted by Yvette. An extended class with Charlotte Temple. An exciting new Ashtanga Yoga class and a Mens Yoga class instructed by Brad van Bylevelt. "For the Love of Yoga" workshop on the 8 limbs of Yoga hosted by A Couple of Yogis. A physically active body must achieve a stable balance around each active joint for top performance. Ligaments connect the bones to each other and provide much of the joints' stability. Muscles are connected to bone by tendons, allowing for movement at the joints. Although the ligaments connecting the bones in the ankle are necessary for proper function, there are several muscles that also help support the ankle during any type of activity. Building strength and proprioception, or special awareness, in these muscles helps to prevent injury and improve performance. In addition to decreasing ankle injuries, strengthening lower leg muscles will help prevent chronic conditions such as shin splints and Achilles tendonitis. Few things go together like chocolate and Valentine's Day. Giving and receiving chocolate has become one of the most popular way commemorate the day of love. The history of Valentine's Day stretches back to the Roman era, but the addition of chocolate as the staple fixture on the day dedicated to the celebration of love is a fairly novel addition. Perhaps it's a marketing strategy of the genius Richard Cadbury of the 19th century that is still hugely successful even to this day. Previously, chocolate was expensive to purchase and only the elite class was able to buy the chocolate from limited resources. Cadbury was able to produce chocolate that was easy on the pockets. His next step was to create beautiful boxes for chocolates with cupid and roses, which were quite popular in Victorian days and were considered as the symbol of romance. Cadbury was actually the one who first invented the heart shaped box of chocolates and changed Valentine’s Day forever for the generations of lovers. An alternative approach might be to challenge yourself to a Dechox this February. Dechox is a nationwide challenge to give up chocolate throughout February. Anything with cocoa in it is off limits - from the sprinkles on your cappuccino, to that 3pm chocolate bar. By getting your friends, family and colleagues to sponsor you, you'll be raising money to fund vital research for the British Heart Foundation. For your health - that great taste comes at a price - lots of sugar and fat, not ideal for your health! A Dechox could help you kick start some healthier habits. For the challenge - the satisfaction of completing Dechox could be reward in itself, especially if you're competing with family and friends! For the cause - every donation you raise, no matter the amount, helps to power life saving research into heart and circulatory diseases. Whether you Dechox or not, check out our delicious alternative to a chocolate pudding in the recipe this month. Welcome to 2019 and our January newsletter! In this month's issue we focus on the Studio and all that goes on there. Check out our article below detailing the classes that we currently have on offer. Our Studio Coordinator Vic Williams is responsible for the smooth running of the Studio. Working with the other instructors to make sure the timetable is delivered effectively and the Studio functions efficiently, she is also one of our Studio instructors, teaching yoga to our rehabilitation practitioners as well as those with a stronger practice. She is a specialist in teen yoga and is an ambassador for the Teen Yoga Foundation and a supporter of This Girl Can - a Sport England initiative to celebrate active women who are doing their thing, no matter how they do it, how they look or even how sweaty they get! Read to see how she fared against our quick fire 15 questions in 60 seconds! If 2019 is the start of a new beauty regime for you, speak to Sue Masters about her exclusive beauty offers available for this month. We have a fantastic team of experienced chiropractors, sports massage therapists, acupuncturists, a podiatrist, nutritionist, psychotherapist, hypnotherapist, homeopath, counsellors, Alexander Technique practitioner and holistic therapist. We strive to offer the highest levels of care and service to our patients and are here to support you with your New Year resolutions or intentions. A welcoming Yin class with Ruth at My Yoga Club. Alexander Technique workshop with Jane. A Mindfulness workshop with Babs at Inner focus counselling. Our very own Yin Yoga and Yiga Nidra class hosted by Yvette. 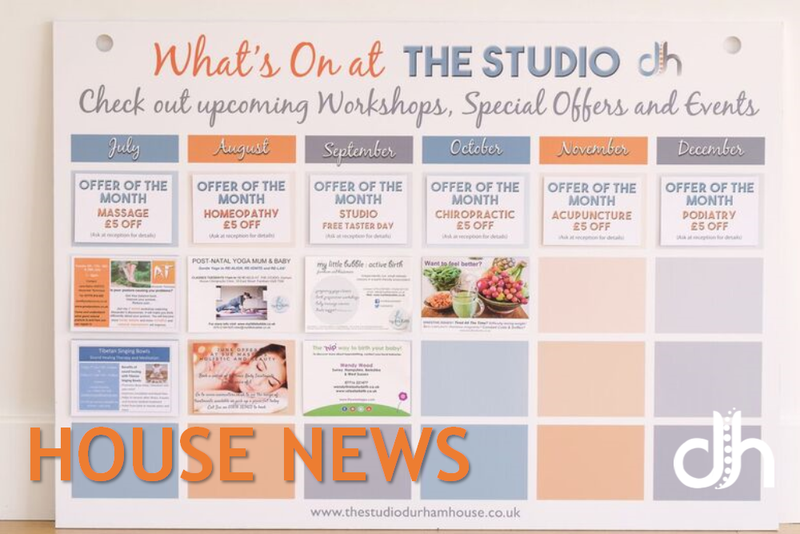 Following on from the success of the Christmas Bliss class, we have added more Rest, Restore, Renew classes to our schedule for the rest of the year. The New Year isn’t meant to initiate huge character changes. It’s a time for you to reflect on your past year’s behaviour and aim to make positive lifestyle changes. Setting small, attainable goals can help you reach whatever it is you strive for. By making your resolutions realistic, there’s a greater chance that you will keep them throughout the year, incorporating healthy behaviours into your everyday life. As promises are made at the end of the festive season, more and more people are committing to making a lifestyle change that requires stronger willpower than going to the gym more than once in the first month of the year! Like all New Year resolutions, sticking to them can be tricky, but what ever you intend to do, try not to worry about it unduly. If you fall off the wagon, you fall off the wagon! Just pick yourself up, remind yourself why you set the intention in the first place and start afresh. It is meant to be fun and enjoyable! It seems that record numbers have signed up to "Veganuary" in 2019 and will be living on a plant based diet, at least for a few weeks. With vegan options becoming cheaper, more widespread and convenient, we try a vegan alternative in our recipe this month. If this is not for you, this lovely tart can be made with dairy options and bought pasty. So, however you make it, enjoy !